This absorbent microfibre dust mop is ideal for all hard floor surfaces, and can be used wet or dry. The extra-wide sweep and angle cut on the broom gives you access to dirt in even the tightest corners, and its dual poly fibres are made to pick up both fine and rough debris. Five year limited warranty. Please contact Quickie Manufacturing for further information at 1-800-257-5751 x 141. The durable split-end fibers on this hand broom, pick up fine dust and dirt. The whisk broom attaches to the dustpan for easy storage. Excellent for quick pick-ups in your home, shop, or car. The wide 12 in. scoop, holds more dirt. It is made of a non-breakable polypropylene. The dustpan snaps onto broom handle for convenient storage. A smaller sized lobby broom that is easy to use for quick pickups, such as in retail locations, parking lots and other locations that require sweeping up quickly and easily. Pivoting dust pan lies flat on floor for easy and quick pickups. Handle length is the same as the lobby broom so that no bending is required. The Rubbermaid 12-1/4 in. Plastic Heavy-Duty Dust Pan has a tooth-edged broom cleaner and flexible edge for a more efficient dirt pick-up. An ideal tool for those quick clean-ups. Ideal for quick clean-ups. 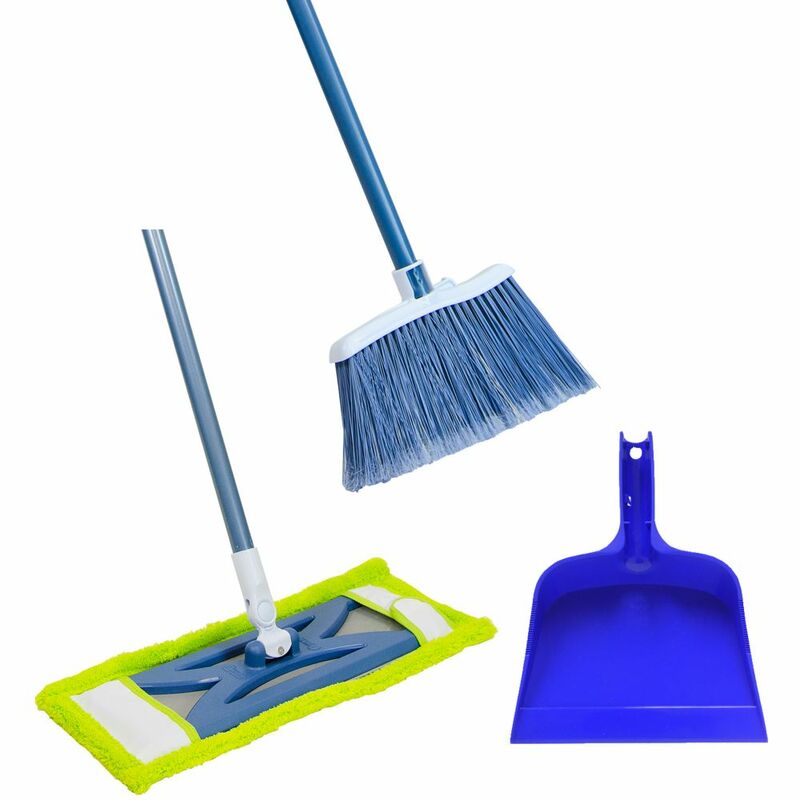 3 Pack Combo - Microfibre Dust Mop / Angle Broom & Dust Pan This absorbent microfibre dust mop is ideal for all hard floor surfaces, and can be used wet or dry. The extra-wide sweep and angle cut on the broom gives you access to dirt in even the tightest corners, and its dual poly fibres are made to pick up both fine and rough debris.